On September 19, a 7.1 magnitude earthquake struck near Mexico City, causing the collapse of buildings, damage to infrastructure, and devastating loss of life. More than 200 people are known to have lost their lives in the disaster. The Salvation Army facilities that were affected by the tremor were evacuated due to structural damage to the buildings, but the operation to assist communities severely affected by the disaster quickly took shape. 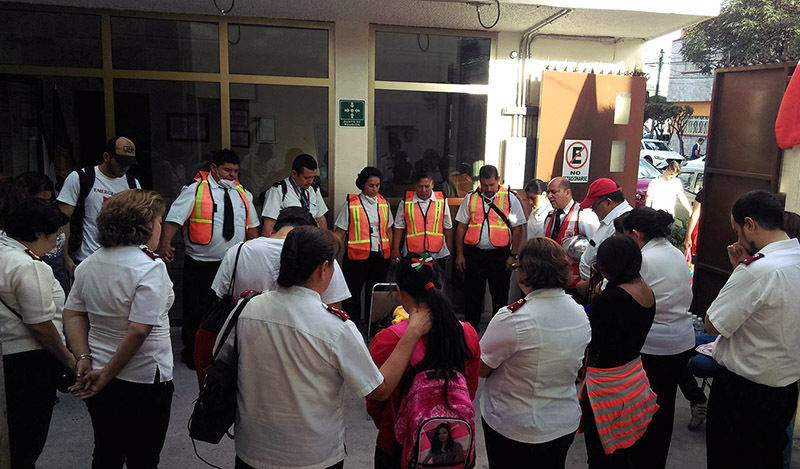 This latest emergency response comes as three teams of Salvation Army officers and volunteers were in the process of providing aid and support to those affected by the September 7 earthquake in Oaxaca and the landfall of Hurricane Katia in Veracruz. Additional resources are being sought. Relief oprations in the city centre were undertaken by four Salvation Army churches (Corps 1, Corps 3, Nueva Atzacoalco and Cocotitlán). They provided coffee, water, sandwiches and refreshments to rescue workers and survivors. Outside of the city centre, The Salvation Army started relief operations in Pueblo, providing 300 meals a day, and across four locations in Morelos, serving over 1,500 meals a day. Over 17 tons of supplies have been received, including food items, hygiene articles, cleaning products, and generators. More than 400 people have volunteered with The Salvation Army, lending their time to tasks such as distribution, administration, serving food and clearing rubble. As relief activities wind down in some areas, recovery efforts will take their place. The earthquakes have left many people homeless, with thousands sleeping under tarpaulins in the street, some in front of what is left of their homes. The Salvation Army continues to assess the needs of the people and raise funds to enable as many people as possible to rebuild both their homes and their lives. Donations can be made securely online at this link.